It can be hard to find toothpaste that does not contain sodium lauryl sulfate (SLS). Most of Tom’s of Maine toothpastes contain it, and for my family, this is an ingredient we avoid. 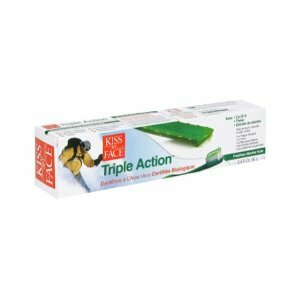 Organic Triple Action Toothpaste by Kiss My Face is SLS-free and works to prevent plaque and tartar build up. Although this product has not been evaluated by the Environmental Working Group’s (EWG) Skin Deep Database, older Kiss My Face toothpastes received relatively low hazard scores. This product does contain sorbitol (plant origin), which with excessive use can cause health problems. Since you don’t swallow toothpaste, it is probably not an issue here. EWG gives sorbitol a hazard score of zero. Xylitol is a great replacement for fluoride in fighting cavities, but remember, it’s not safe for dogs! The strong minty flavor of this toothpaste makes it inappropriate for young children, but it sure freshens Mommy and Daddy’s breath! Undersocks are the new essential winter layette piece, designed for keeping baby’s feet and legs warm and comfy. Undersocks are soft, bamboo thermal underpants with plushy socks sewed into the bottom. 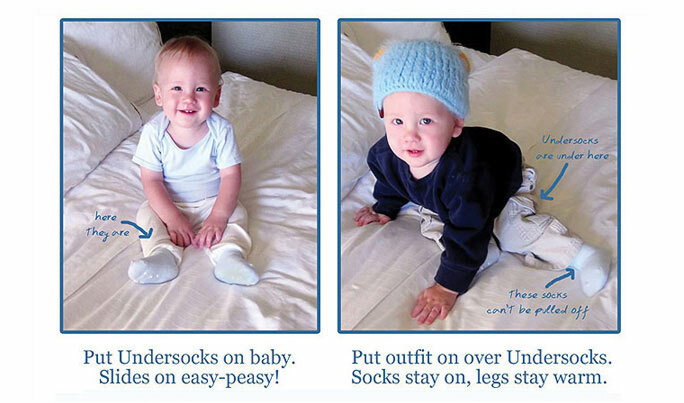 They are made to be worn underneath your baby’s favorite outfits as a warming layer. Keeps socks on baby’s feet and keeps the entire leg warm too. Made of ultrasoft, breathable bamboo thermal fabric that feels great against baby’s sensitive skin. Made in the USA, these are great idea and easier to put on then tights, as well as appropriate for either gender. I do have concerns about bamboo though. Bamboo is often touted as eco-friendly because it grows very fast and regenerates itself quickly. I know from my own experiences gardening that it is a heavy feeder, so I worry chemical fertilizers are used on bamboo plantations. Furthermore, chemicals are used to rett the fiber from the stalk. Thus, I have questioned whether bamboo really is green. Would I buy this product? If made from organic bamboo, then yes. I’m very particular about children’s literature, and I love the classics. Many modern books try to reach a moral about the current plight of humanity and the environment, but often the awkwardness of text and weird characters interfere. That’s the case with Weebeasts: Plight by Micah Linton. In the search for a new home, they find places that are too wet or too dry somewhat emphasizing the scarcity of truly livable land left on Earth. Unfortunately, the idea of the Weebeasts leaving their home because they are unkind does not come across strongly, other than an illustration of them netting some neighbors. There is a slight message of tolerance when they find their new home, but it’s all a little befuddled. This book is part of the Tree Neutral program that “offsets the number of trees consumed in printing this book by taking proactive steps such as planting trees in direct proportion to the number of trees used. This book is printed in China and has a strange poofy cover. When you buy cleaning products, whether eco-friendly or not, you are paying for a lot of water. Not only are you paying for something you can get much cheaper out of the tap, that water weighs a lot (eight pounds a gallon) and contributes to a product’s carbon footprint due to transportation. Bio+Green Crystals is a concentrated, refillable sachet you add to water. It ismprofessional strength, whatever that means, and biodegradable. Bio+Green Crystals, are revolutionary new Crystal compounds in water-soluble pouches containing pre-measured amounts of compounds. When immersed in the water, pouch and powder dissolve formulating a precise cleaning solution for specific cleaning purposes. Bio+Green Crystals are proud to be ZERO-WASTE products. Bio+Green Crystals products are not only eco-friendly in their operation but also protect the environment through reduced warehousing, transport, breakage and usage of shelf space. Our products have the ability to reduce the carbon footprint through all channels of value stream, making them the most favored option for our customers. Bio+Green Crystals claim to be zero waste, however, I don’t see how that is possible. The packaging is not entirely recyclable. I’m not throwing plastic in my compost pile as advised by the company. Would I buy these products? Yes. Other than what I consider to be a false claim of zero waste, these products are bio-based and natural. They do not contain petrochemicals, sodium lauryl sulfate, or phosphates. Without full disclosure on the package of ingredients, I have to trust the company’s non-toxic “under normal use” claims. These cleaning products are made in the USA. Editor’s note: For awhile now, I have been publishing product reviews as a series called “5 ‘Green’ Products“. Now product reviews will be posted daily and then assembled into a round-up on the weekend. We’ll see how the change goes! Parents should avoid feeding their children out of any plastic containers, including BPA-free ones, as they leach chemicals that are harmful to health. 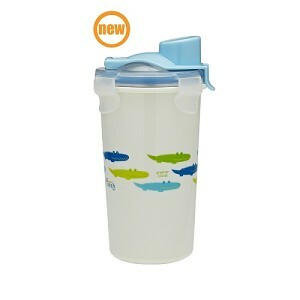 Innobaby has developed a stainless steel cup that is BPA, phthalate, PVC, and lead-free. I’m still a big fan of the Klean Kanteen Sippy Cup, which unfortunately is made in China. Innobaby products are made in South Korea. The Klean Kanteen is quite simple in comparison to all of the parts of the Innobaby, and I am not sure how these parts will hold up over time or how hard they will be to clean if left with rotting chocolate milk in them for days forgotten in the hot car. The parts are all dishwasher safe on the top rack, but handwashing is recommended. Would I buy this product? Probably not. It has too many parts. I like that it is all silicone and stainless steel and the outer shell protects hands from hot or cold beverages, but I can see losing parts or scrambling to put it together while my child is impatiently waiting for a drink. It is also more expensive than the Klean Kanteen ($18 versus $13). We still use five-year-old Klean Kanteen sippys, and it is really easy to get replacement parts for them. In my experience, lids get lost and break. I don’t worry about the lack of lid. Germs are inevitable to some degree. As an author of books for children and a psychologist in training I would like to reiterate to those that may have missed or overlooked the underlying principles of the Weebeasts as to their fundamental purpose. They are a simplistic representation of us as humans only devoid of ethnicity, cultural boundaries and gender biases that more than often compose our foundations of fear, discrimination, and compromise aspirational values such as personal growth. 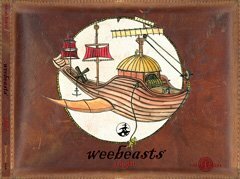 By striving to subject readers to an experiential emancipation from the mundane and influential commercial propaganda so prevalent in our society, I have created the Weebeasts as a tool for transcending the inherent limitations of the manipulative and controlled mental conditioning that the current problematic and paradigmatic differences we as humans subject ourselves to. By eliminating such conditioned responses to our own egotistic limitations, the Weebeasts allow children and adults to actively engage in a world filled with creatures from beyond our own boundaries and as uncomfortable as they may appear at first glance, they do in fact offer a minute reflection of our inner Self in pure form. If one happens to be left disturbed or bewildered, then I have done my job in challenging readers’ sensibilities and can only hope they take the time to reflect on where those emotions originate. Contemplation and reflection are among the top echelons of achievement for any author or artist and I sincerely thank you for any feedback positive or negative as it means you have your own cognitive sense of reasoning and innate perceptions. Our life should be a quest for a greater understanding with an emphasis on gaining knowledge and cultivating wisdom, not conforming to external pressures of normality and commonalities such as the conditioned perceptions of the masses which ultimately rely on systematic modules of commercialization and media influence for acceptance resulting in an incoherent and mindless consumption of material goods and services. The Weebeasts are simply transpersonal creations, in that are they are beyond the scope of human identification with the ordinary, as such, one may even deem them to be extraordinary. Regard my books as a gauntlet that has been thrown down, a challenge to those that see a potential future with less separation and discrimination. By challenging own our children to think for themselves instead of regurgitating the one sided and jaded views prevalent in our Western modes of cultural and social conditioning, we can introduce an entire new paradigm of critical analysis and thought provoking ideologies that are consummated by individuality and personal expressions of uniqueness. Long live the Weebeasts, may they serve if just for a brief moment, as a thought provoking glimpse of an inner journey by halting the rampant and boundless egotism that plagues our civility, humanity, and causal effects of undisciplined attachment to conformity by unifying fundamental elements of what self-awareness actually entails by confronting preordained notions and liberating one from the stupors of mindless entertainment. Dr. Weil recommends Orthaheel! Proper foot care promotes optimum health!